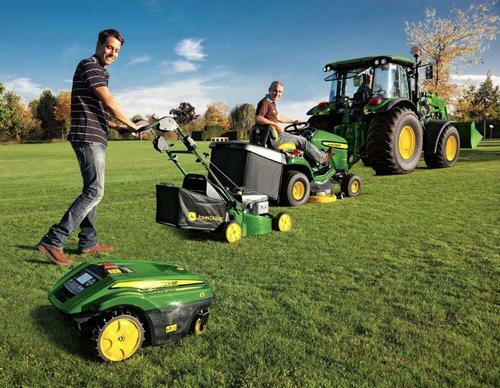 John Deere celebrates its 50th anniversary as a lawn and turf equipment manufacturer in 2013. The company entered this new market in 1963 in the US, with the production of its first lawn tractor at the Horicon Works factory in Wisconsin. That model 110's four-stroke petrol engine produced 7hp. Since then, the product range has grown steadily and now includes a comprehensive choice of domestic lawn and professional turf equipment for homeowners, commercial customers, groundsmen and greenkeepers. An original 110 can be seen at the Smithsonian Institution's National Museum of American History in Washington, DC. A fully restored, working example of this pioneering lawn tractor is also on display in the foyer of John Deere's UK headquarters at Langar in Nottinghamshire, and is featured on the company's stand at the 2013 RHS Chelsea Flower Show in London in May. "Since 1837, innovation and quality have been a tradition at John Deere," says Karsten Biber, European turf segment manager. "Having successfully entered the lawn equipment business 50 years ago, we've been reaching a wide range of new customers who are linked to the land, beyond our traditional agricultural market. Now we offer probably the broadest product range in the lawn and groundscare industry." At the time of the 110's launch, lawnmowing was developing into a popular leisure activity during a period of growth in the US economy. With a well-founded reputation as a premium equipment manufacturer, John Deere was therefore able to establish its new turf business very quickly. For a time, the company offered lawn tractors in other colours, in addition to its famous green and yellow livery, but this was only temporary. In the 1970s the product range expanded with the introduction of rear engine and diesel engine riding lawnmowers. By 1972, John Deere had also introduced the first electric powered lawn tractor, which required three car batteries to operate. Riding lawn equipment was becoming more and more popular at this time, particularly in the American market. As a result, the John Deere factory at Horicon celebrated the production of its one millionth lawn tractor in 1984. On entering the professional golf and turf equipment market in 1987 in the US, John Deere reinforced its commitment to the lawn and groundscare equipment business. Since 1994 the golf and turf business has also been established in Europe, offering a wide range of technologically advanced greens, fairway and rough mowers as well as machines for commercial mowing. John Deere acquired German lawn equipment manufacturer SABO of Gummersbach in Germany (and its Dutch brand Roberine) in 1991, attracted by SABO's leading brand image and product experience in the field of walk-behind mowers. In 1994 the turf business was established as a separate division within the company, alongside agricultural machinery. In subsequent years, John Deere has continuously expanded its market presence as well as the product range, and celebrated the production of its 500,000th Gator utility vehicle and five millionth lawn tractor, from the X700 Ultimate diesel engine range, in 2010. John Deere then entered a completely new product area for the company in 2011, with the introduction of the Tango E5 autonomous mower, an in-house development from Gummersbach. In 2013, built on 50 years of experience and innovation in the lawn equipment business and the strength of its dedicated servicing dealer network, John Deere's comprehensive product range includes lawnmowers, compact and large utility tractors, commercial golf and turf equipment and Gators for private gardeners, professional landscapers and local authorities as well as greenkeepers and groundsmen at all levels.